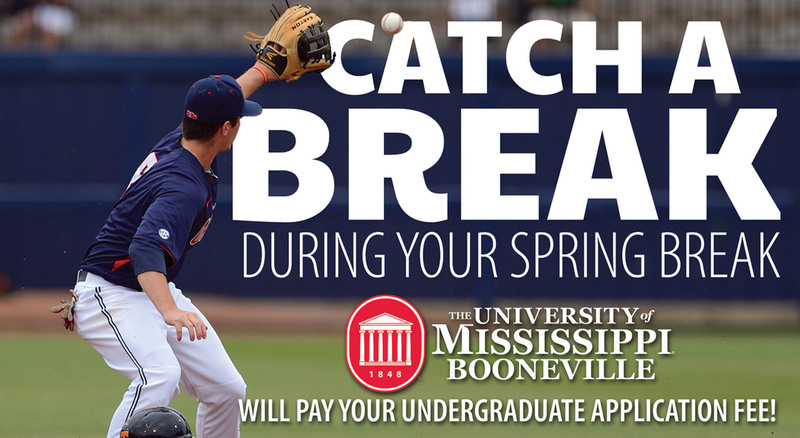 UM Booneville will pay your undergraduate application fee! STOP BYthe University of Mississippi-Booneville office anytime (8 a.m.- 5 p.m.) during the week of March 12-16, 2018. MEET with your Ole Miss Admissions Counselor to ensure you are ready to transfer. COMPLETE AN APPLICATION for undergraduate admission to the UM-Booneville campus for Summer or Fall 2018. This promotion is only available on the University of Mississippi-Booneville campus. The application fee waiver is not available for students applying to the Ole Miss main campus in Oxford.